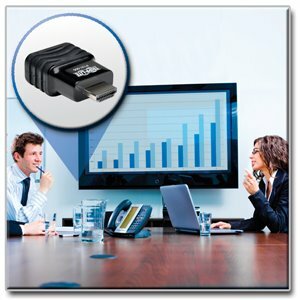 Tripp Lite's P131-000 is a compact HDMI to VGA adapter, designed to allow computers with HDMI output to be connected to VGA monitors and projectors, it is perfect for use with laptops and Ultrabooks. It supports resolutions up to 1920 x 1080 at 60 Hz. No external power supply is required. Compact, molded one-piece design makes for easy carrying. Tripp Lite’s P131-000 HDMI to VGA Adapter ensures peak performance when displaying an HDMI video signal on a VGA display. Use it to connect devices such as a laptop, tablet, Chromebook™ or Ultrabook™ to a VGA monitor or projector. Featuring an HDMI male connector on one end and an HD15 female connector on the other, the P131-000 is an easy solution for viewing your device’s desktop on a larger screen. With its compact design, the P131-000 easily fits into your computer carrying case for on-the-go convenience. The P131-000 is constructed of top-quality materials and has a compact one-piece molded design. With no external power or drivers required, it’s completely plug-and-play. Connect your devices and you’re ready for action. This adapter supports resolutions up to 1920 x 1080 (1080p) and is compatible with computers equipped with a female HDMI port. The P131-000 comes backed by a three-year warranty and is manufactured in compliance with strict RoHS specifications, reflecting Tripp Lite’s commitment to environmental responsibility.